Panda model is seen on a monitor at the National Taiwan University of Science and Technology (NTUST). World's first panda robot is taking shape at the cutting-edge lab where an ambitious group of scientists hope to add new dimensions to the island's reputation as a high-tech power. The world's first panda robot is taking shape at a cutting-edge lab in Taiwan where an ambitious group of scientists hope to add new dimensions to the island's reputation as a high-tech power. The Centre for Intelligent Robots Research aims to develop pandas that are friendlier and more artistically endowed than their endangered real-life counterparts. "The panda robot will be very cute and more attracted to humans. Maybe the panda robot can be made to sing a panda song," said Jerry Lin, the centre's 52-year-old director. Day by day, the panda evolves on the centre's computer screens and, if funding permits, the robot will take its first steps by the end of the year. "It's the first time we try to construct a quadrupedal robot. We need to consider the balance problem," said 28-year-old Jo Po-chia, a doctoral student who is in charge of the robot's design. 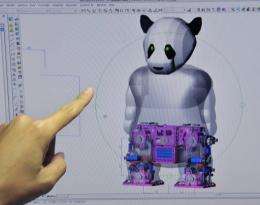 The robo-panda is just one of many projects on the drawing board at the centre, which is attached to the National Taiwan University of Science and Technology, the island's version of Massachusetts Institute of Technology. The Taipei-based centre also aims to build robots that look like popular singers, so exact replicas of world stars can perform in the comfort of their fans' homes. "It could be a Madonna robot. It will be a completely different experience from just listening to audio," said Lin. Commercial value is what counts for Lin, who hopes to contribute to the Taiwan economy at a time when it has matured and no longer exhibits the stellar growth of the earlier take-off phase. "If I write 25 academic papers, I won't contribute anything. But if I create something people need, I will contribute to the Taiwan economy," he said. Lin and his team are also working on educational robots that can act as private tutors for children, teaching them vocabulary or telling them stories in foreign languages. There is an obvious target market: China, with its tens of millions of middle-class parents doting on the one child they are allowed under strict population policies. "Asian parents are prepared to spend a lot of money to teach their children languages," said Lin. Robots running amok are a fixture of popular literature but parents do not have to worry about leaving their children home alone with their artificial teachers, he said. "A robot may hit you like a car or a motorbike might hit you. But it won't suddenly lose control and get violent. Humans lose control, not robots. It's not like that." Lin's long-term dream is to create a fully-functioning Robot Theatre of Taiwan, with an ensemble of life-like robots able to sing, dance and entertain. Two robotic pioneers, Thomas and Janet, appeared before an audience in Taiwan in December, performing scenes from the Phantom of the Opera, but that was just the beginning, Lin said. "You can imagine a robot shooting down balloons, like in the wild west, using two revolvers, or three, but much faster than a person. Some things robots can do better than humans with the aid of technologies," Lin said. His vision is to turn the show into an otherworldly experience where robots and humans mix seamlessly on stage, leaving the audience in doubt which is which. But the bottomline is the bottomline. Lin wants commercial viability, in the interest of his home island. "I want to be able to go to an amusement park in the US and see a building where on top it says, 'Robot Theatre from Taiwan'. That's my lifetime goal," he said.